I just happened to be browsing around the other day, and ran into this pretty insane looking video by cathedrow. I can honestly say this is the most ridiculous program I've seen to date running on the TouchShield. I mean seriously, how on earth did you do that? The funny thing is, I must have seen this in passing, but never really spent a lot of time there. There were a couple of pretty interesting projects that I think I'll try to make with my Arduino one of these days... the point would be to prove that you can make a lot of things with the Arduino, and that it really does simplify life quite a bit! -Homeland security helmet - A slight spin on this one that might be fun might be to make a little desktop interface that turns the TouchShield different colors when the security status changes? -Mesh networking - actually, this one's probably not too hard to do, given some of the cool stuff over at Libelium. 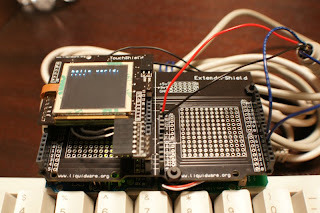 I have two of the Libelium Xbee shields right here on the desk, so maybe it's time to try them out! -Solar panel module - I think solar power is definitely the future, but the hardest part is getting a large enough current to make it useful. 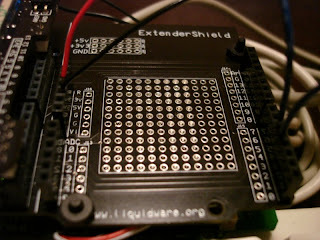 Anyway, next time I buy something from digikey or mouser, I'll grab a few panels too. -Qwerty keyboard - the funny part is that Pete posted this one himself. Hey Pete, feel free to grab some of the code I wrote over here! That should work for any PS2 keyboard (I'm still working on the USB one... let me know if you make anything cool with it). -Mass storage reader - Hmmm... that's really interesting. I know Limor has hacked out SD access on her media shield... I wonder how hard it would be to make something similar for USB drives, for instance? -Motorcycle lap timer - I can't bring myself to buy one of the expensive ones they sell in catalogs, and I feel like I could make a decent one myself now. Anyway, thanks again for all the links and inspiration. What am I doing still typing? I have lots of projects to work on! I got a bunch of nice emails, and a nice list of cool project ideas too. Also, I saw a comment on the website suggesting I should try to hack together a Frogpad keyboard, so I just bought one and I'll give it a shot! If I manage to get an Arduino reading and writing from a the Frogpad keyboard, I'll be sure to post the source code, and pictures. In the meantime, I've been inspired to upload a bunch of scans and ideas from my engineering ideas notebook up to the invention lab page. I'm thinking that I'll start posting a bunch of scans for ideas, and based on comments and any emails, I'll try my best to code them and make them real projects (of course it'd be nice to have some help too)! 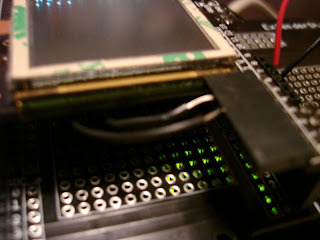 Arduino and TouchShield pretending to be a laptop from Matt Bitz on Vimeo. 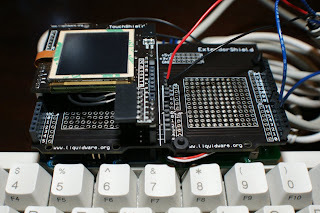 Ok, so speaking of things people emailed me about, I've also written up a quick wiki describing the common functions of the TouchShield. I made the whole reference completely wikiable, so anyone can chime in and contribute, or add functions they find useful. I don't like it when wiki's are set up by people with lots of complicated user permissions and passwords, and anyway I think that defeats the whole purpose of a wiki anyway. I hope it's helpful! You can check out the function reference over here. What is the projects page all about? Well, a couple of folks have written in saying they liked the new projects section, and I’m really flattered (thanks David and Jorge)! That was actually the first thing I’ve ever written in Ruby, and I have to be honest… it wasn’t as easy as everyone makes it out to be, and I'd be lying if I didn't have a lot of help. Seriously, maybe it’s because I grew up with the old school linear programming metaphor etched into my brain, but when it comes to Ruby, I really struggled (I mean it’s kinda nifty to write things out like sentences with the object model, but it can get confusing too). I tried really hard to make the colors match. I have to say thanks to my really good friend Matt (no, not me, really, another Matt), who helped me with the graphic design – thanks! I think the biggest problem is that I couldn't really find something that worked exactly like what I needed. Wiki's were a little too unstructured, and uploading photos can be a pain, most of the source code repositories - even the newer ones - are focused on text, and the description and tutorial part comes later, instruction sites like instructables was the closest for me, but the funny thing is that it's not set up for source code projects... so I guess the answer was to write my own. 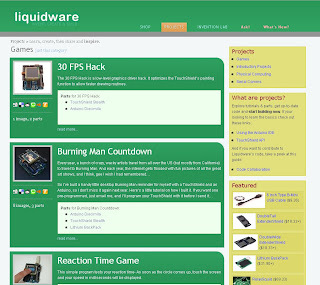 I’m going to try to upload all the projects I’ve made with the TouchShield onto the site, since I was running out of places to keep the source code, pictures, and instructions all in one place.